A blog is still a website, with its own set of elements and features that create the kind of web design that we are most satisfied with. The last decade on the web has proved that blogging is a sustainable method of expressing oneself, as well as consuming content in a variety of different ways. Getting started with your own blog has also become somewhat of a leisurely experience, a good domain name and a reliable hosting company is all we really need to have our own WordPress based blogging enterprise up and running, or we may resort to alternatives like Blogger, Tumblr, amongst others. Whether a creative looking to attract new clients, or a business that realizes the quintessential importance of a blog as a medium of generating more leads, blogging has something to offer to all types of web users; even those who have never written an intentional paragraph before. Much like a portfolio website works, we can use our blogs to advertise our talents, to express our ideas, and to connect with an audience that reaches far beyond the horizon of our expectations. 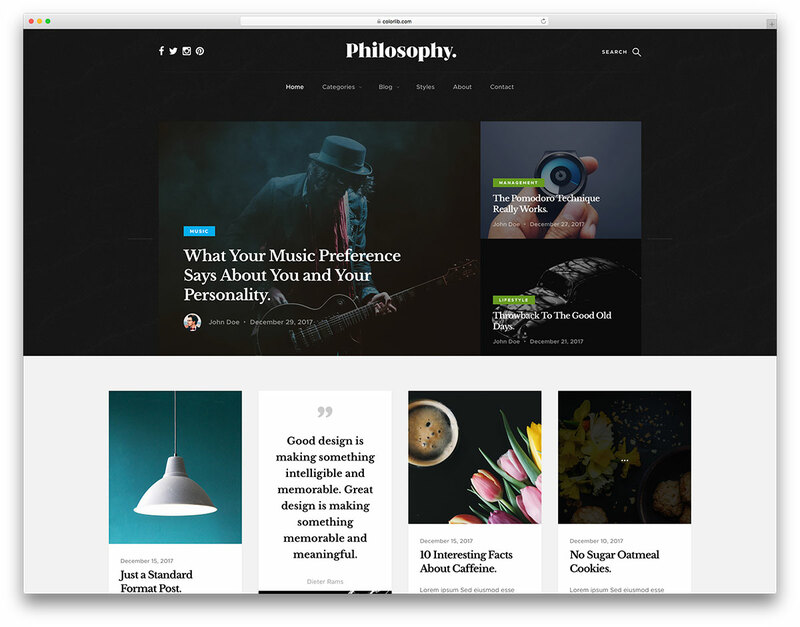 Building your own blogging site from scratch will initially require a little bit of effort, especially in the department of design. Choosing the right template for your blogging site can be a tedious process, and only because there are so many choices to choose from. Colors, font choices and alternations, navigation menu placements, social media integration amongst other things are the features one will want to pay attention to the most, while it’s easy to build a personal blog style that reflects versatile thinking, we also want to ensure that our readers are happy with our choices, though it’s important to leave an imprint of personality in every design. 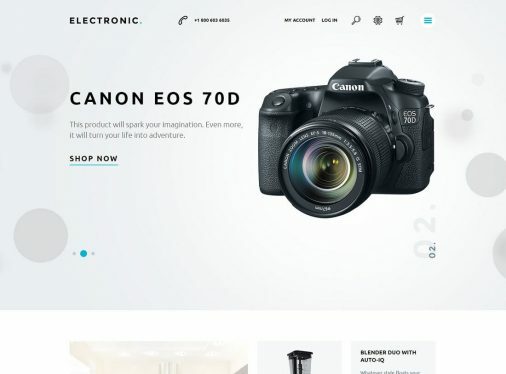 The following free Bootstrap blog templates we are about to explore have all been carefully selected with the latest web design aveends in mind, as well as to provide a simple templating system where you can easily make and alter any kind of elements that perhaps you feel are obsolete to your vision of a good looking blog. Whether to launch a standalone blog site, or to incorporate any of the following templates in your existing websites, these designs are going to provide an easy to consume content experience that you will come to realize is so important to a successful blogging path. 2M+ items from the worlds largest marketplace for Bootstrap Templates, Themes & Design Assets. Whether that’s what you need, or you’re just after a few Stock Photos – all of it can be found here at Envato Market. With as versatile tool as Shapely is, you can do numerous things and realize many different websites for your business ideas. 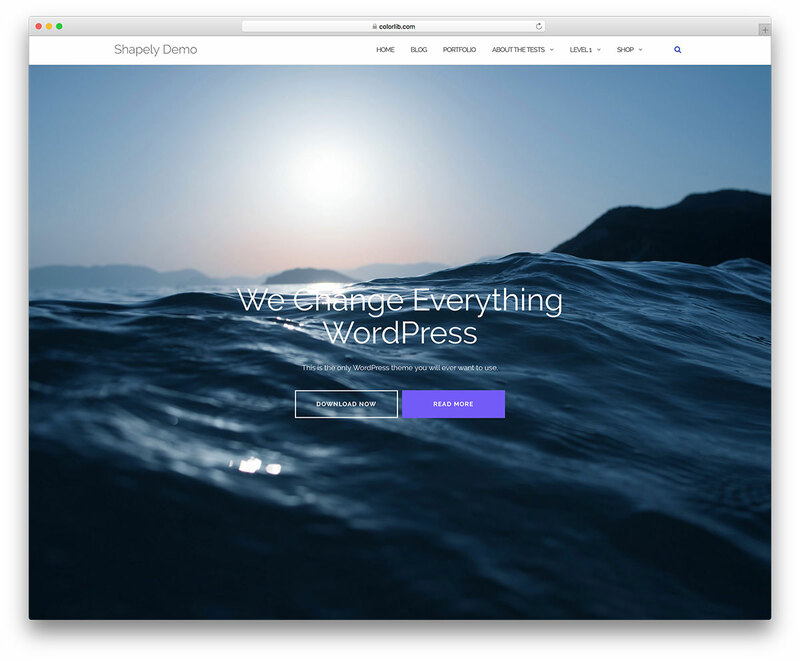 While the other in the collection are HTML templates, Shapely is WordPress exclusive. With super simple to use interface, even utter newbies can have professional pages live in a pretty short period of time. Do not let your imagination stop you rather go all in and start the process of actualizing your blog and have it live in a snap. Shapely is responsive, retina-ready, cross-browser compatible, search engine optimized and does not shy away from you translating it. Globalize or localize the tool, enrich it with your favorite plugins and enhance it according to your needs. It might just happen that Shapely is the very last template that you will ever need. Actually, it is an almost guarantee. Bounty is a free Bootstrap blog template that also offers you to build an online magazine page if there is interest. Indeed, Bounty is very versatile and highly adaptive, altering to your needs and regulations without a sweat. On top of that, you can always tweak and adjust it, making Bounty follow your branding wants to a T. The tool is organized and documented, making sure everyone gets the most out of it. Yes, even if you are a beginner at website development, you can still profit from the free template, Bounty. 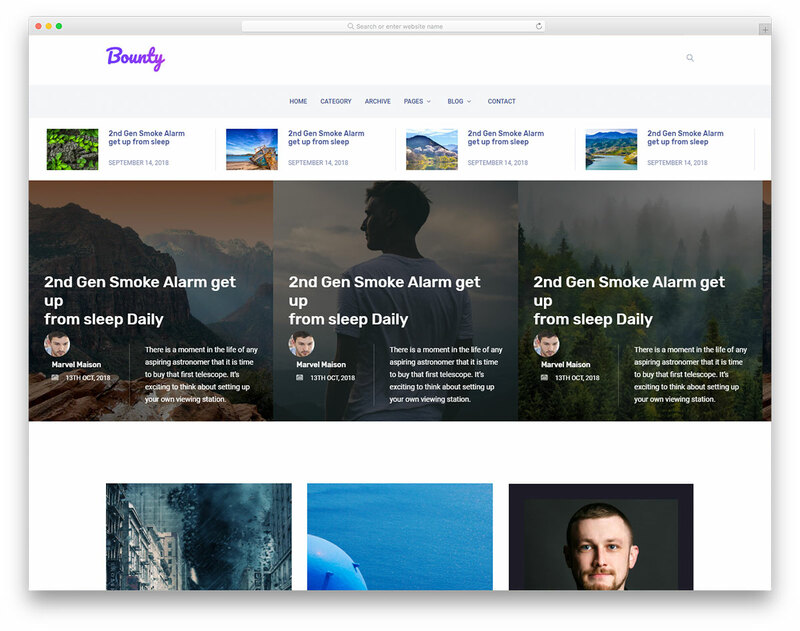 Carousel slider, sticky navigation, hover effects, Instagram feed and widget-rich sidebar are some of the core features of Bounty. Since it is a Bootstrap template, that means the layout is also 100% mobile-ready. Go ahead and start your blogging adventure with Bounty today. 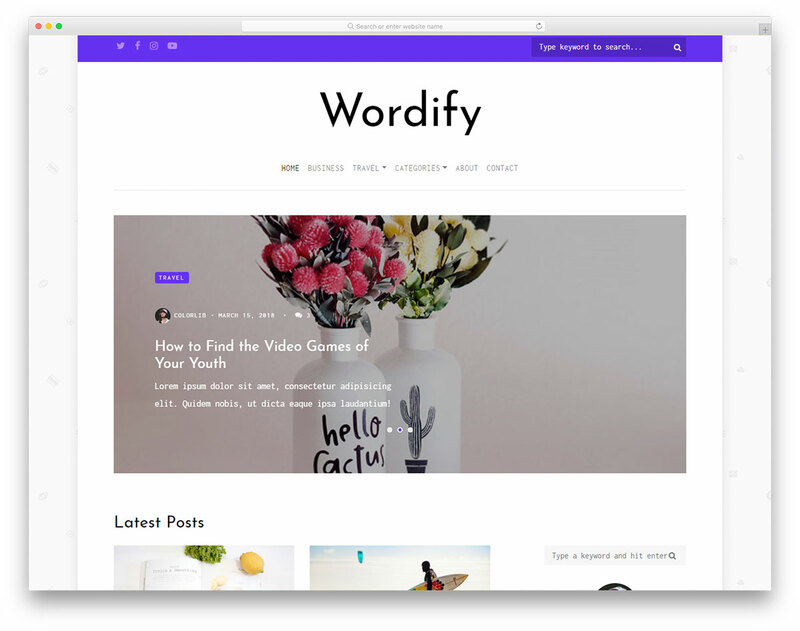 Hence the name, Wordify is a free Bootstrap blog template for writers and journalists alike. Regardless of the niche, you are passionate about, you can utilize Wordify however you fancy. Thanks to its clean, minimal and elegant look, Wordify adapts to all your wants almost instantly. Even if using it as is, you only need to add your custom content and it will already match your purpose perfectly. What’s more, feel free to adjust and enhance Wordify as well and bring the experience to a whole new degree. Wordify comes with a slider, drop-down menu, loads your compelling content on scroll and includes a bunch of useful widgets. There is also an about page and a full-blown contact section with a form. Little do you know, once you start working with Wordify, the end product will be ready for the launch quicker than expected. If you are an avid traveler, you probably already thought about starting writing a blog a couple of times. If that is the case, why haven’t you realized your idea yet? Chances are, you are still in search for the best web design that will match your adventurous lifestyle. Thanks to Explore, the search is over now. This free Bootstrap blog template is here, ready and set for you to kick off your project once and for all. 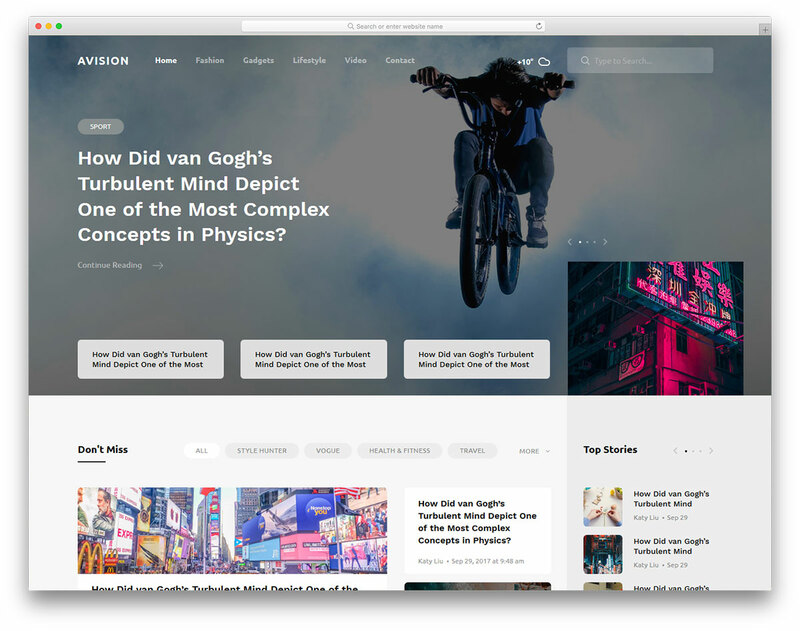 The web design of Explore is minimalistic, making sure everyone gets the most out of your articles. Word “distraction” is not part of Explore’s vocabulary. You will find an enticing split-screen slideshow that will intrigue all and everyone. Explore is also entirely responsive to work seamlessly on all devices, as well as popular web browsers. It is also speed enhanced to make sure your page loads exceptionally fast. You can capture their emails with newsletter subscription widget and even link your blog with your thriving social media accounts. Wait no more, the solution is here. Opium is a multi-concept free Bootstrap blog website template that caters to a variety of different niches. Whether you are interested in personal, lifestyle, fashion, food, travel or DIY blogging, Opium is ready to accept your needs. It will keep you away from building the desired blog from scratch thanks to the outstanding and jaw-dropping ready-to-use web design it sports. There are loads of different features and goodies Opium has in store for you. From a cool banner with slider above the fold to awesome blog post listing, social media icons, Instagram feed and newsletter form, the list of traits goes on and on. Take things into your hands and manage and maintain a growing blog with Opium. It is a near guarantee that whoever visits your page, he or she will be impressed and start to crave more of what you do instantly. If you are starting a cryptocurrency blog, avoid the hard work and go with Newsbit. This free Bootstrap blog template is ideal for the crypto industry, packed with all the needed material for a successful launch of something fresh and novel that the market needed. Since Newsbit is powered by Bootstrap Framework, you know the tool is flexible and mobile-ready, instantly adapting to any screen resolution. Besides, Newsbit is retina set and compatible with all modern browsers, too. Newsbit has a clean, professional and to the point boxed web design with a rich home and enticing single blog page. It comes with a basic drop-drop menu, working contact form, newsletter subscription widget, top bar and social media icons. Just download the template and you can start immediately. 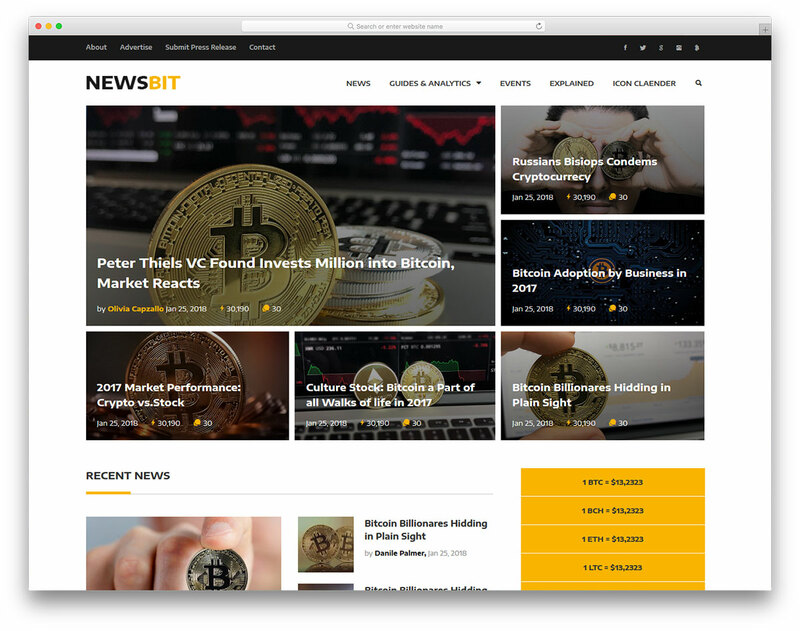 Before you know it, an active cryptocurrency blog is ready and set to go live thanks to the impressive Newsbit. 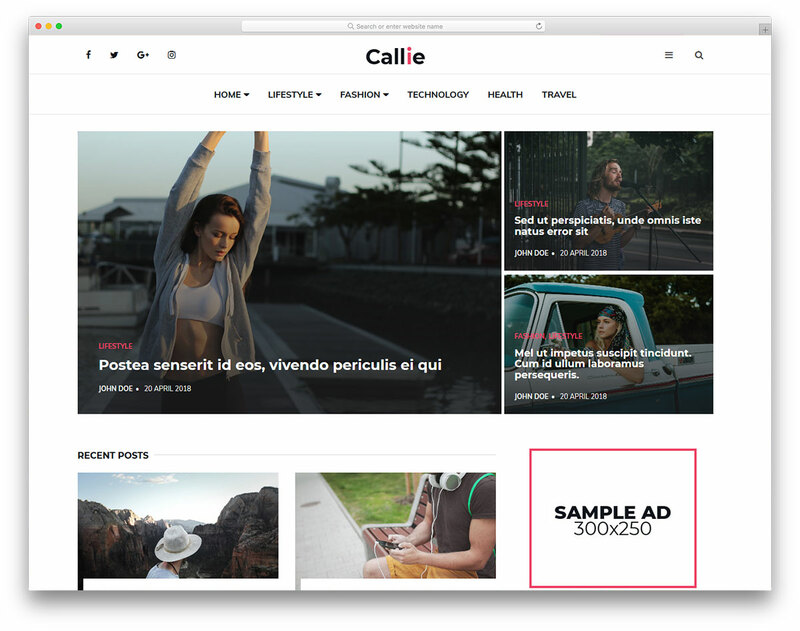 Regardless of your blogging project, Callie is the free Bootstrap blog template that will alter to it seamlessly. 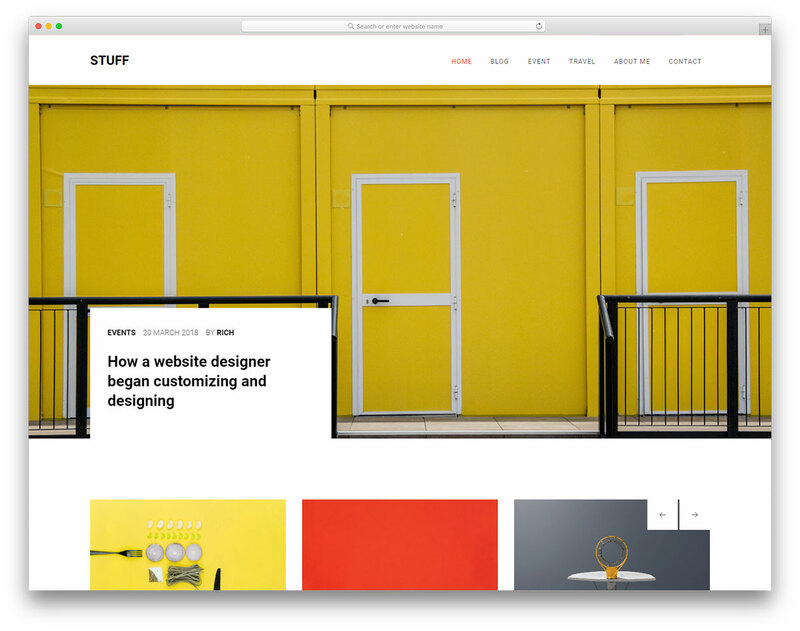 It is a minimal looking site skin which you can use for both blogs and online magazines. Moreover, it could be fashion, travel, lifestyle, food or a mixture of everything, Callie can handle it all with ease. 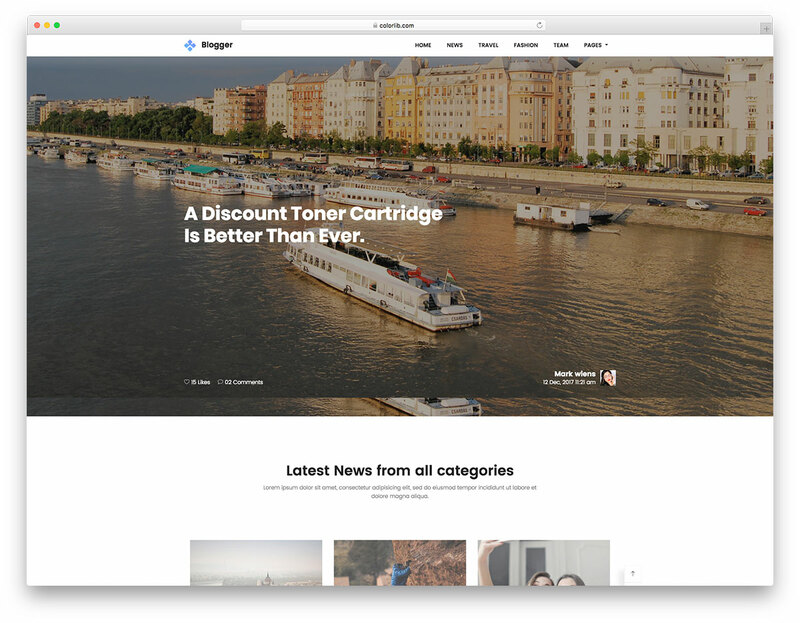 With the integrated mega menu, you can create a solid site navigation that will take your readers to their desired content in a snap. 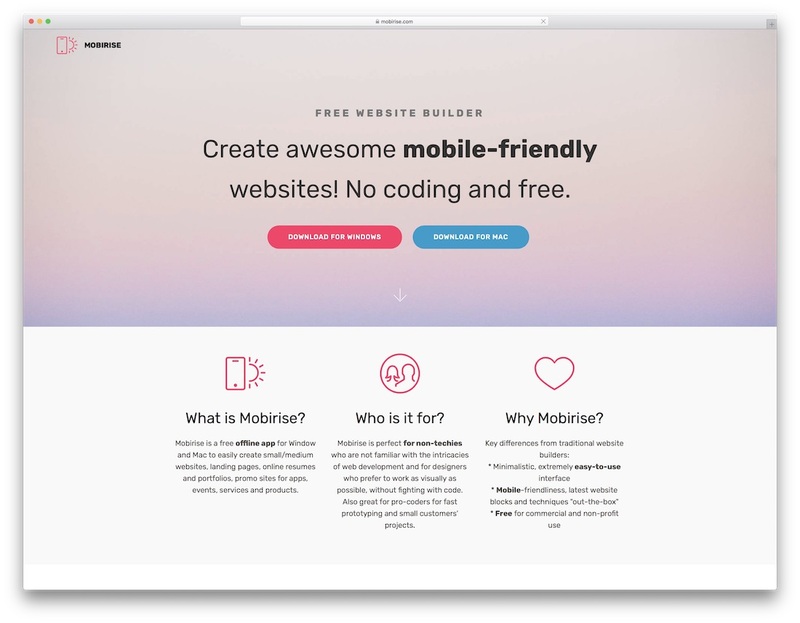 Callie has a widget-rich footer section, sidebar menu overlay, contact page with an active form and a front page that will amaze everyone who visits your web space. What’s more, Callie is also equipped with ad spots for future site monetization. Once you grow your blog to a certain volume, do consider placing advertisements on it that will pay off your expenses and then some. If words are your passion and creating compelling content is your career goal, then you should start your online project today with Wordsmith. This free Bootstrap blog template has a creative and innovative feel to it, ready and set to realize your concept as soon as you would like. And if that is this very moment, just hit the download button and start the epic journey to success. However, feel free to see Wordsmith’s live preview page first before you fully commit. Whatever Wordsmith does, it does it with focus and elegance. 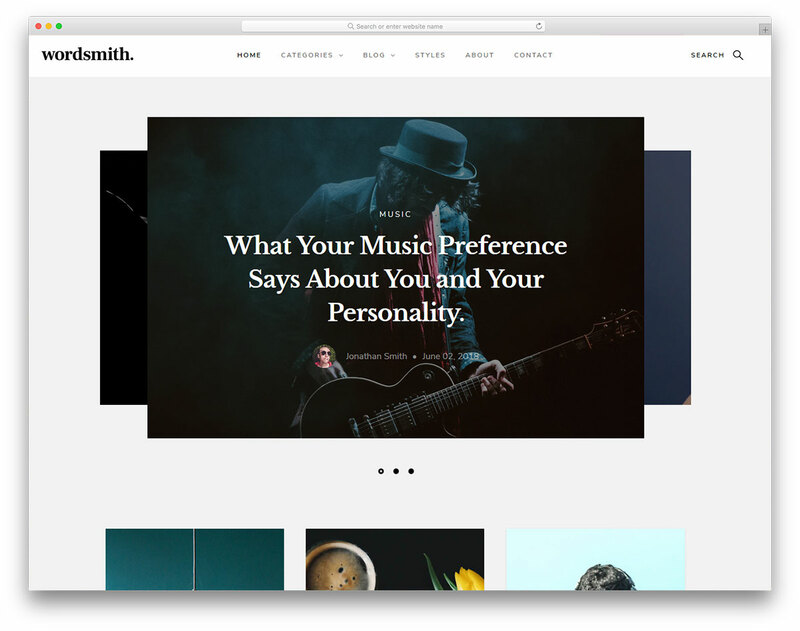 Let it be loading content on scroll or displaying video and audio blog posts, Wordsmith is here to please not only you but, most importantly, your loyal fan base. Publish all types of blogs, create an enticing about page and offer them to reach out to you by employing the functional contact page. You can quietly start a new blogging project and come out with a bang by utilizing the striking Quitelight. There is a ton of variety you can do with this free Bootstrap blog template out of the box. However, if you would like to step up the game, enrich Quitelight’s web design with your signature touch and customize it however you see it fit your idea best. Quitelight is simple to work with, effortless to customize and optimized for a performance like none out there. Quitelight is also 100% mobile-ready and acclimatizes to all modern web browsers to ensure an always stable experience. You will barely notice Quitelight is actually a free template once you start investigating it further. Discover all its amazing features and assets and get good use out of it whether you are a beginner or a pro site developer. While there are loads of free Bootstrap blog templates available on the market, we always make sure to deliver only the most promising ones. Not only that, in this collection, you can find a broad range of different web designs for you to easily find the one that best resonates with you. If you are the kind of person who likes to do things differently, do implement this same strategy in your blog by downloading the one-of-a-kind Libro template. Libro has a split screen layout where one half is a slider and the other half dedicated to your enticing content. Mix and match the two together in a way no one will ever be able to hold him or herself back. Libro is here to have your visitors hooked forever. Hover effects, menu overlay, comments, contact page with working form and Google Maps, these are a few of the assets Libro has in store for you. See it live now and let Libro take your breath away. You do not really need to be a chef to start your very own food blog with Foodblog. You could be an amateur home cook who is passionate about coming up with new recipes, willing to share them with the world. 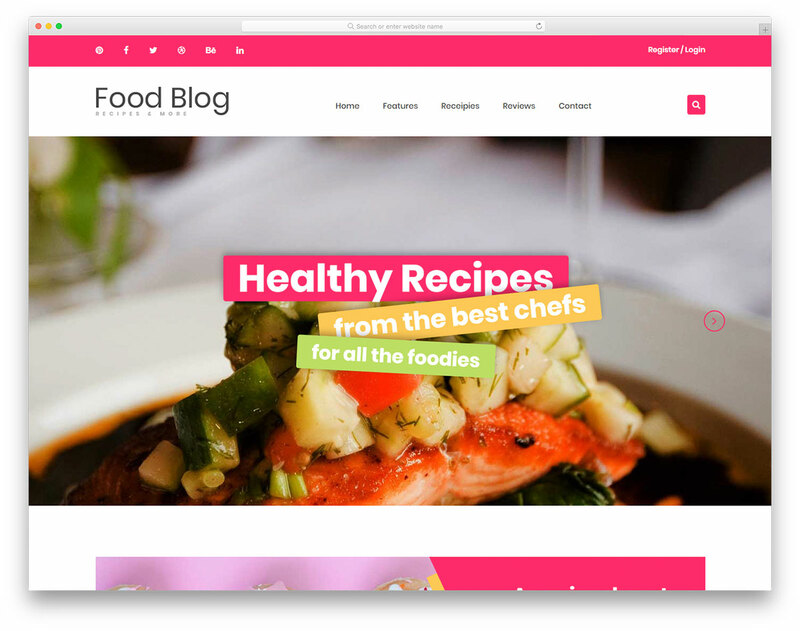 Either way, if you would like to enter the world of blogging, Foodblog is a modern, elegant and trendy free Bootstrap blog template for you to consider. The web design of Foodblog is clean and minimal, perfect for displaying your tasty food creations and other whatnots. No need to be looking elsewhere if everything food-related is what you would like to base your project around. Get your hands on Foodblog, download the tool and employ all its excellent assets. Foodblog is responsive, features a full-width slider, rocks a special recipes page with the advanced search option, as well as a contact section. 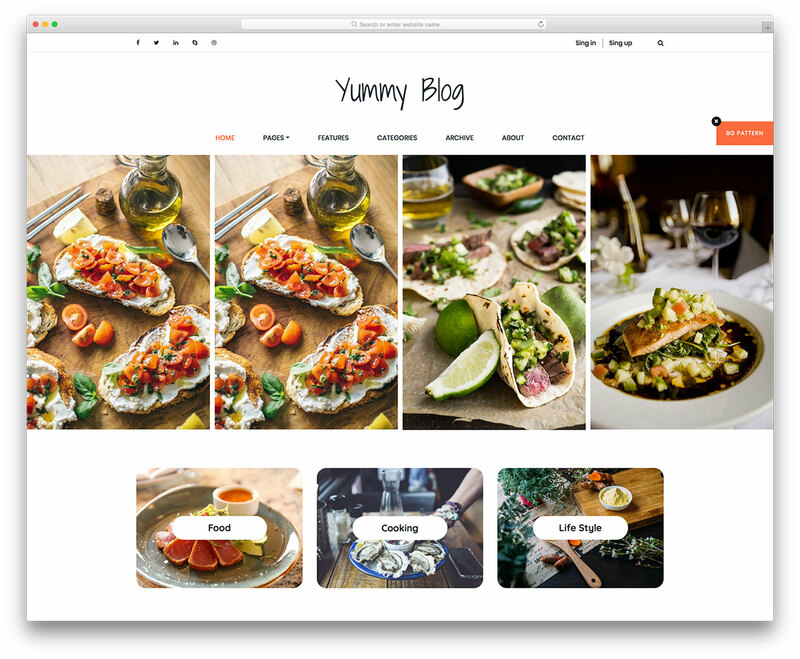 With a few tweaks, you can also use Foodblog for your restaurant and other tasty projects you are working on. 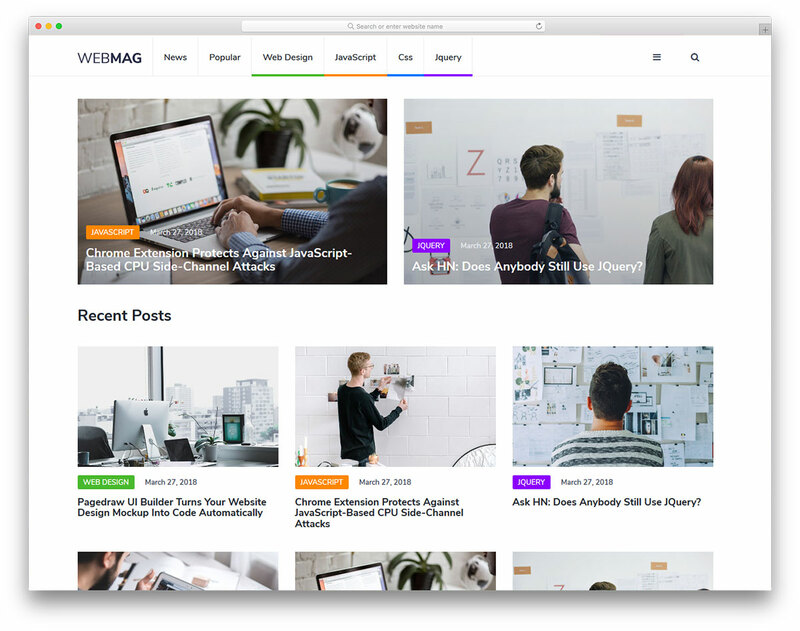 WebMag is nothing else than a professional website template for building online magazines and blogs alike. Due to its neat and tastefully executed web design, enticing random guests and making them start craving your content does not sound very strange with WebMag anymore. Furthermore, WebMag is also equipped with all the latest technologies to ensure cutting-edge performance for all your readers. Speaking of which, WebMag is ready for smartphone, tablet and desktop users since it fluently adapts to all screens. Among a vast collection of features, some of the major ones are retina-readiness, newsletter widget, practical contact page and comments. WebMag also comes with integrated ad spots for when you would like to start monetizing your page and take it to the next level. Inside a post, social media icons stick to the screen and navigation only appears once you start scrolling back to the top. 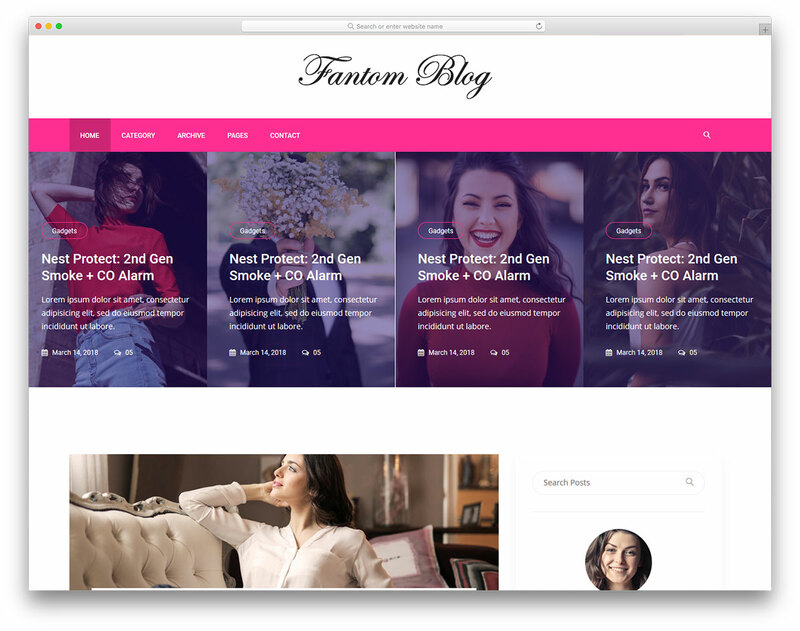 When you feel like ready to finally take the plunge and realize your blog idea, get familiar with Fantom first. 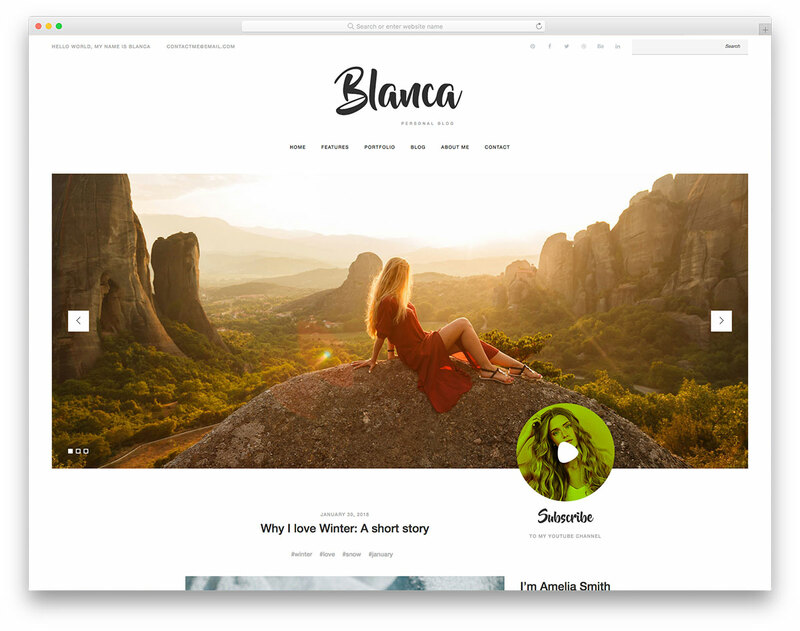 It is a free Bootstrap blog template that gives you the freedom you deserve when setting up the ideal page that best resonates with your project. Fantom emphasizes your content by placing it front and center for everyone to enjoy it to the fullest. The tool helps you capture their attention and has them around for a longer time (hurray for low bounce rate). Some of the features of Fantom are carousel slider, widget-rich footer and sidebar, Instagram feed and predefined ad placements. Of course, no one says you should use Fantom exactly as is. By all means, we encourage you to modify it however you see it fitting your plan best and have a completely customized version of Fantom hitting the streets of the internet. With hundreds if not thousands of free Bootstrap blog templates available at the time of writing this, finding the ideal one can become a challenge. But if you came here, you need not to worry about struggling to find the item of choice. We, indeed, have something for you. And even if you happen to be a picky user, again, we have all the answers to your web design questions. Since you already check quite a few of the templates we hand-collected for you, you have not seen anything as similar as Avision. To some extent, it might look very basic and nifty but all the magic is in the details. Avision sports a full-screen slider, sticky and transparent navbar, various widgets and a newsletter subscription form. It also fully supports video and other types of posts and comes with a very basic, yet active, contact form. Avoid the fancy stuff and keep things as simple as you possibly can. 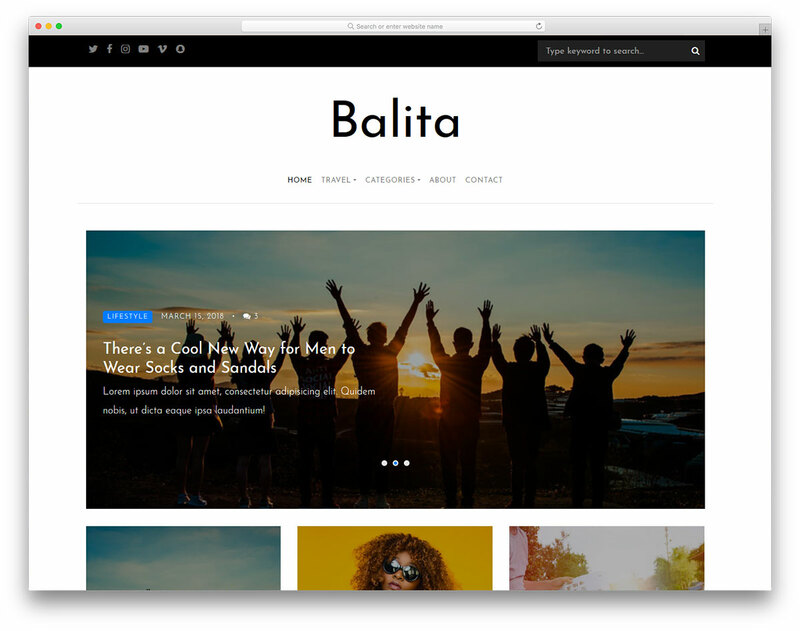 When it comes to your upcoming blog’s web design, Balita is a solution many of you will like dearly. It is a free Bootstrap blog template furnished with handy assets which you can take to your advantage and craft a smashing blog with it. You only need to download Balita and you are on the right path to a successful launch of a refreshing online journal which you can use for an array of different niches. There is a way of employing Balita as is or you can do your own thing by customizing the template with your individual touch. Balita is simple to use, organized and high-ranking page canvas for you to turn into a thriving blog. Do not waste the time any longer and start crushing it. Minimalistic and clean blog templates are amongst the favorites between new and already advanced bloggers. They provide an easy way to leave focus strictly on the content that’s being published, and Stuff takes care of this task very beautifully. It’s a great fit for business, personal and other creative projects that want to focus solely on the said words, rather than the five million widgets popping up all over the place. 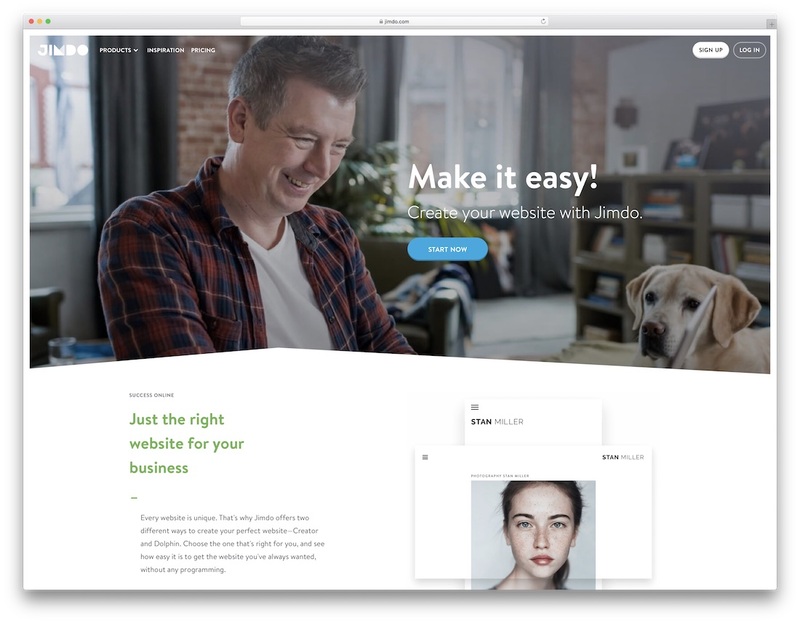 The template comes pre-built with a blog homepage, a page for talking about yourself, a sample content post, as well as a page for establishing a contact me feature. It’s fully responsive which means all devices will love to work with this template. And the modern design with a little touch of color adds to the overall pleasant browsing experience. Utilizes the LESS pre-processor for easier development workflow. 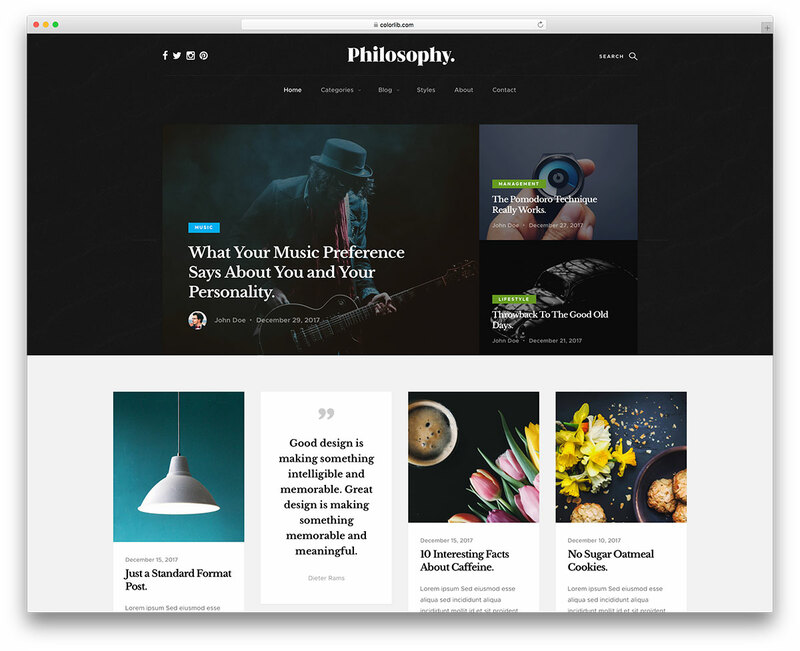 Philosophy template is a great example of how flexible Bootstrap can be when it comes to building modern websites (or blogs) using the FLAT design principle. This professional template will suit bloggers and writers who are looking for a strong ‘professional’ touch to their blogging experience. The design choices feature a lot of stylish fonts and widget concepts, all of which can quickly be erased and turned into whatever you think is necessary for your own blogging experience. An open footer area can be used to promote your own About information, to insert social media widgets or simply to advertise your other content — also the combination of all if necessary. 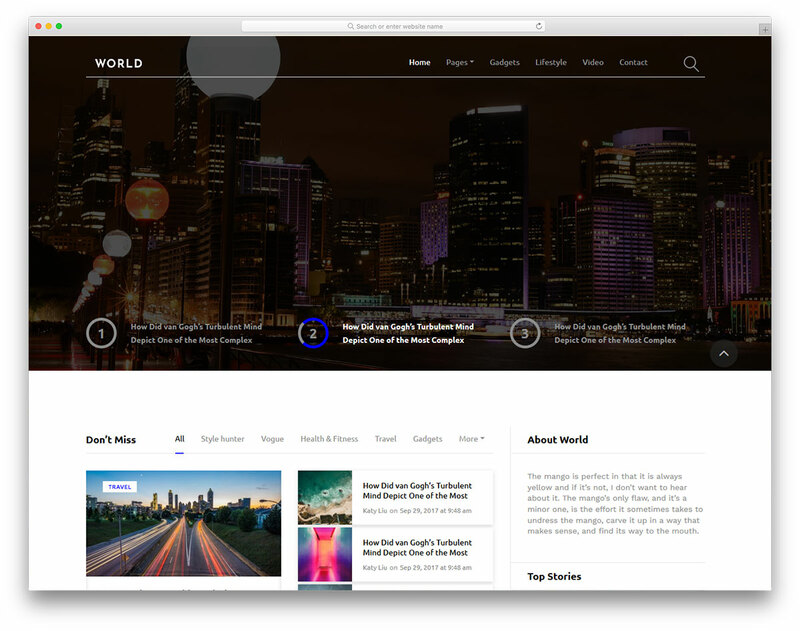 World is another spectacular work of art (something we don’t see that often, especially in the category of Bootstrap templates). Posts pages feature a feature image slot, a strict area for content, as well as a comment box that’s visible right after the content ends. Play around with font and font sizes to improve the experience if you feel the need. The only thing that’s truly missing in this template is some sort of social sharing option. We feel it would be the perfect fit for such a solid choice of colors and fonts. 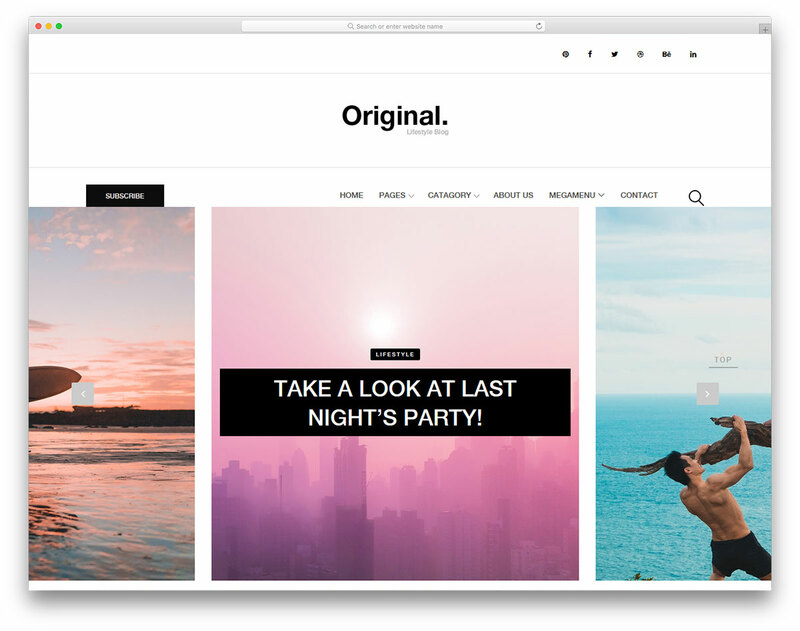 Original is the first Bootstrap template on our list that utilizes full-grid templating patterns. This is what other web designers might call the “Pinterest effect.” Such style choices have grown in popularity since the inception of the popular social media site for sharing images. Original uses a very lightweight choice of colors and background color that focus on providing readers with a pleasant and laid back reading experience. Still, it maintains the touch of professionalism in case the template needs to be used for business purposes. Beautiful navigation bar that can be used to display your logo, your social media icons, as well as menu items of your choice. Are you a fashion blogger? Perhaps looking for a design that reflects the feminine side of your writing. 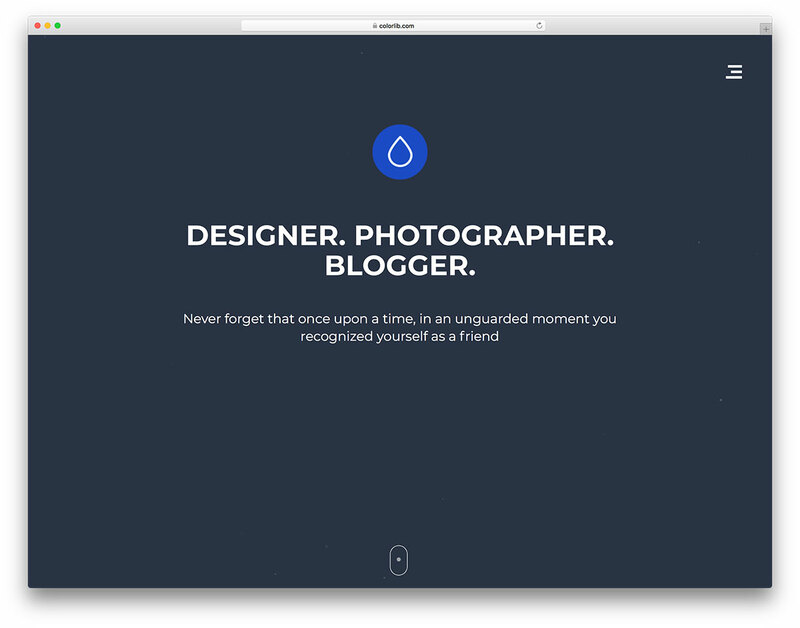 Droppler is a great choice for bloggers who want to highlight the sensitivity of their writing. The color scheme of Droppler is perfect for expressing detail and attentiveness to the subject you’re talking about. Features a beautiful slider that will allow you to showcase your most trending content. Moreover, the sidebar widgets offer a way to collect email addresses for your list, as well as display your latest social media postings on Twitter. Takes full-advantage of the latest features in CSS3 and HTML5; as per Bootstraps framework. 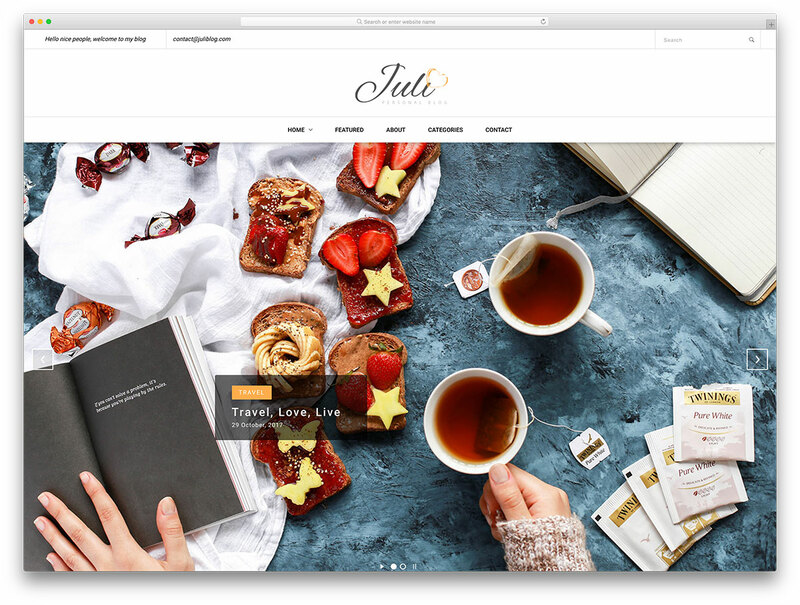 Juli incorporates clean and flat design elements that will work great for personal blogs, as well as blogs for restaurants, food bloggers, travel writers and other similar fields of interest. The code base is beginner friendly, meaning that making changes to the design are going to be elementary. The lavish design is built to maintain the factor of simplicity, and the minimal grid system makes it a pleasure for readers eyes. Works well with all modern browsers, and devices — full-responsive integration. Features an in-built slider that can be used to display a featured image at the very top of your blog. Besides, there is also a more compact slider at the footer of your pages to display more of your content. 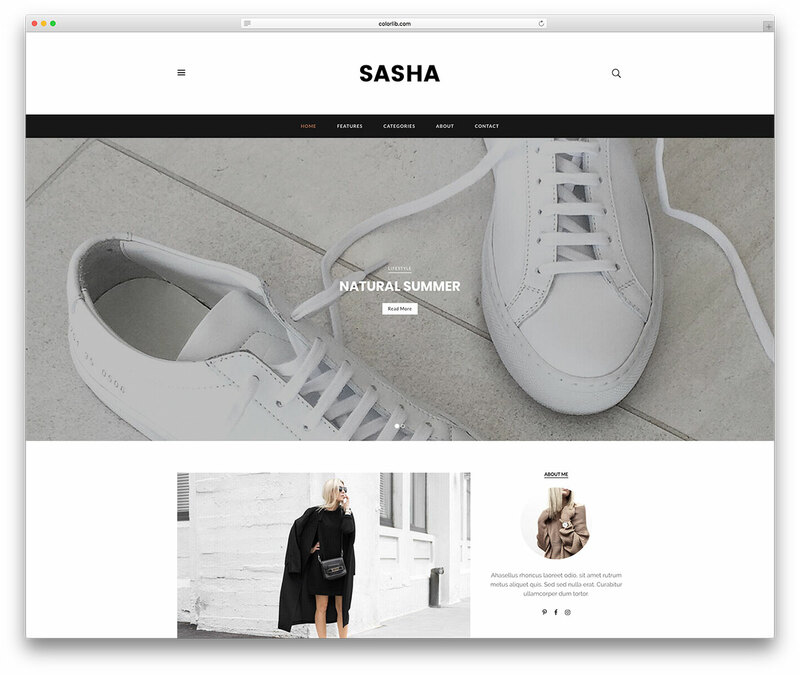 The Sasha blog template introduces a more sophisticated, creative, way of expressing your blogs design. The post listings offer a traditional template of Title, Image, and Content, while the major change within this design apart from others is the use of background patterns to enrich the overall reading and blogging experience. Posts are also amplified with a beautiful related posts widget that will help you rake up more views on your other content. On top of that, the strong menu at the top will ensure that your readers can always learn more about yourself, and your content. Personal blogs have always been about content that you publish, and the audience that you interact with. In that sense, personal blogging templates have never been cluttered or focused on fancy widgets. Instead, the focus remains on easy to access content. It also features a simple commenting system that can enrich the whole blogging experience for both parties. Article is one such template that puts it all in perspective. A simple blog index page displaying latest content, and an easy to look at posts template that focuses on the written content, while highlighting a comment box at the bottom of each page. 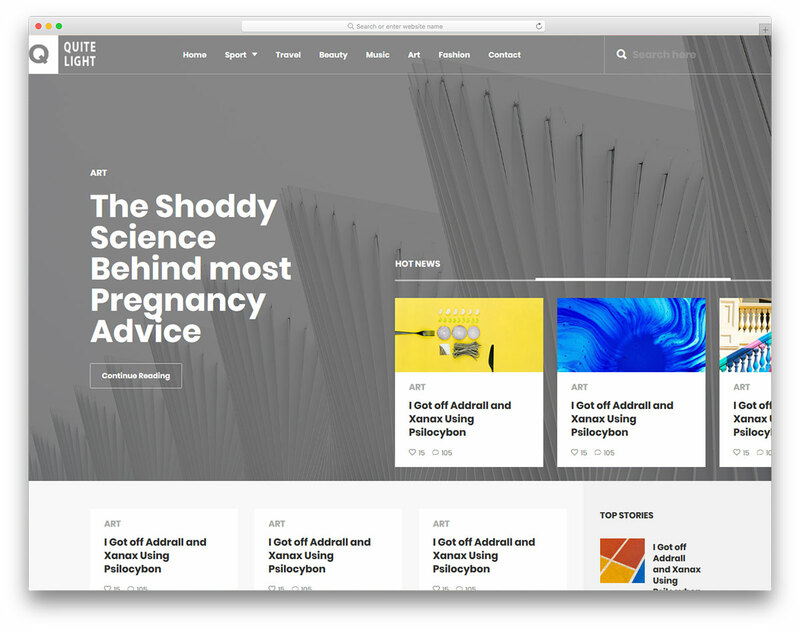 Sidebar consists of traditional recent posts and comments, as well as archives and categories widgets; you can use a logo image within the top navigation bar. Each passing day a number of new designs are introduced within the plethora of template sharing websites we encounter on daily basis. And technology-oriented templates are some of the most sought after. 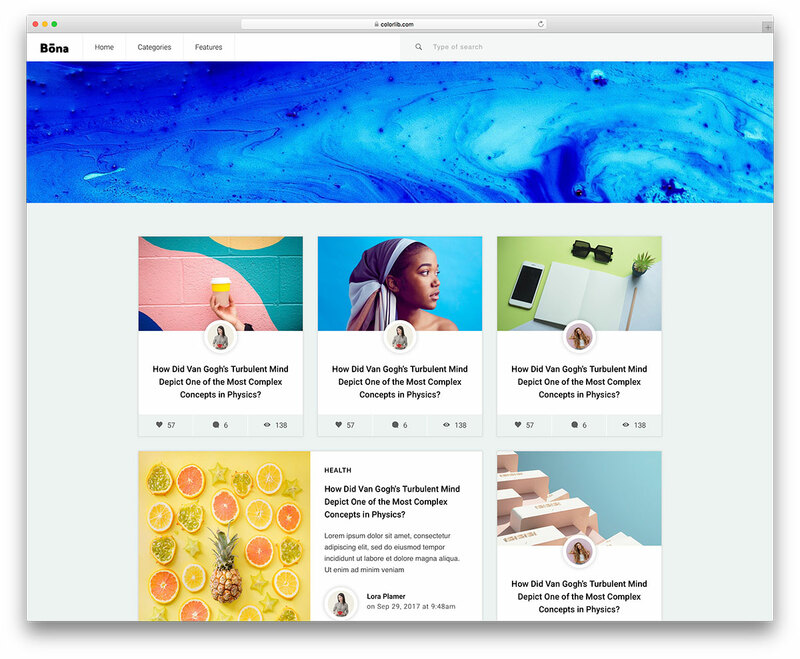 But why pay for a premium design when we can indulge in something as beautiful as the Blogger template? It has been specifically built to reflect technology oriented website traits. 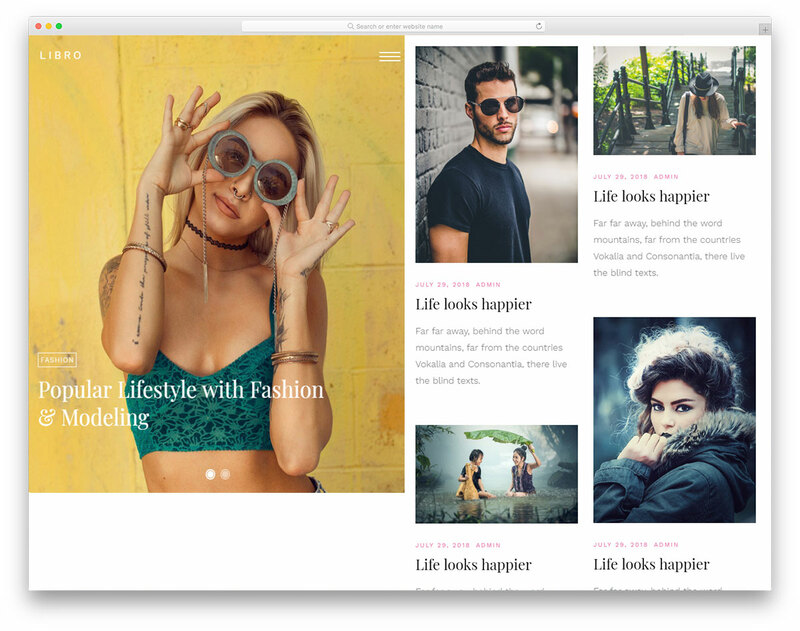 A grid style content browsing template on the homepage will naturally capture readers attention and interest in your other content. While the content pages themselves focus on a professional approach to reporting news, sharing stories, and even telling stories; post pages also feature an interesting related content widget for all your content promotion needs. Yummy is a truly delicious looking free bootstrap blog template that will make you look a professional blogger from the get-go. Even if you are new to the world of blogging and you do not have much capital to invest, pick a premium-looking free template like Yummy is. Originally for building a food blog, but you can feel free to use it for any other niche blog you would like. It is a light, fresh and clean template based on Bootstrap that will readjust to any screen size instantly. Mobile users will especially enjoy browsing your marvelous content from their smartphones and tablets. 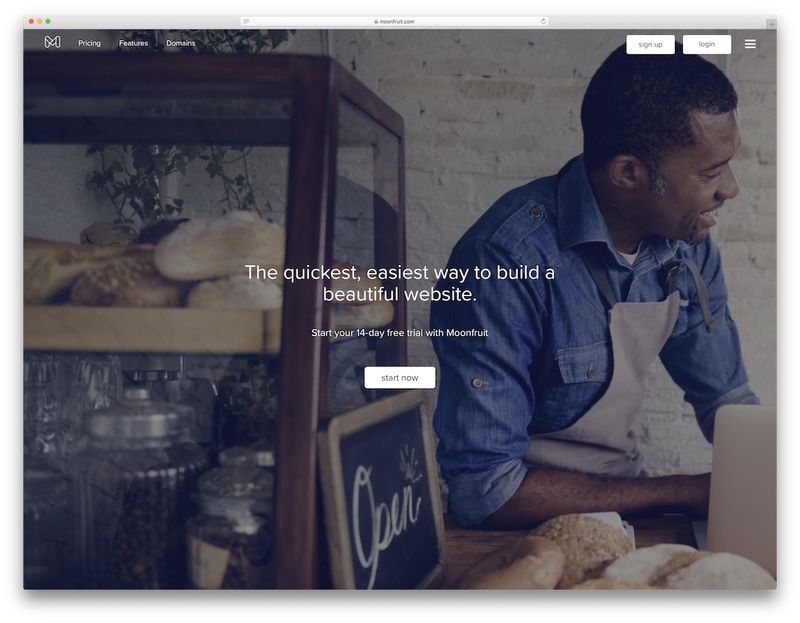 With the unique look and a fantastic full-width slider, feeding all hungry eyes will be easy as pie. Along with the stunning slider, Yummy also comes with social media icons and a beautiful Instagram feed slider. Both the main and the Instagram slider are of the same style which is very appealing to the eye. There is a lot of uniqueness you will find in Yummy template that will perfectly correlate with your content. Food, lifestyle, fashion and many other niche bloggers can find Yummy an ideal fit for their websites. It will make them easily recognizable, plus, turn unique visitors into regular ones. For the most part, blogs seem quite similar compared to each other. Rarely any blogger uses something entirely different regarding the design of his or her website. If you would like to go against the grain, Suppablog Bootstrap blog template is the ideal tool for you. What you will notice right off the bat is the minimalistic approach it has to its look. Half of it is a big picture and the other half showcases blog posts. I bet that is something you seldomly see bloggers use for their pages. It surely is not an everyday practice. Clean and straightforward. 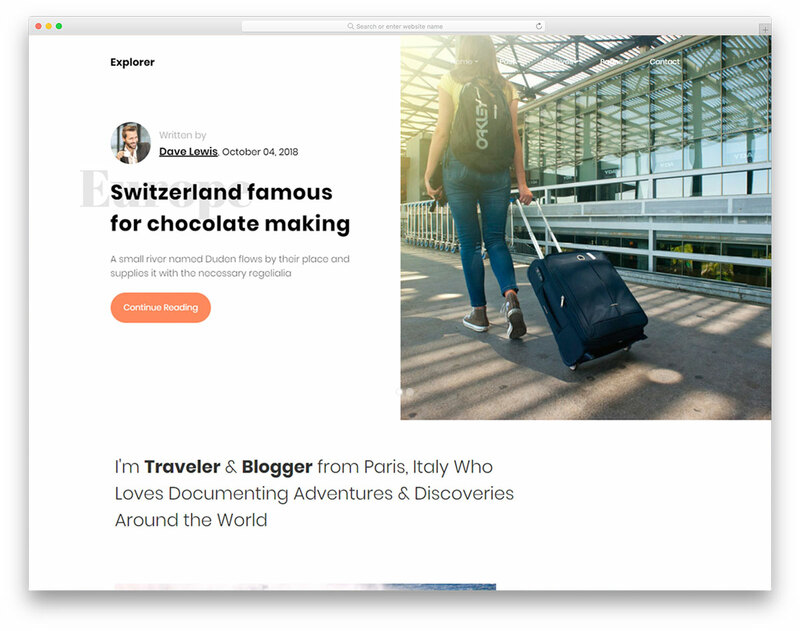 Another very unique feature of free blog template, Suppablog, is the one-of-a-kind hover effect. When you place your mouse cursor on the desired content, it blurs all the rest and highlights only the one you are interested in reading. Kinda cool, don’t you think? On the right side, Suppablog has social icons with access to the off-canvas menu. Writers and bloggers, you just found one original template that will make you stand out from the crowd easily. Make a great impression on everyone who comes to your page. With minimalism and creativity, you can have them secured for life. All you need to do is to add your compelling content and success is ahead of you. Bona is an elegant and contemporary free HTML blog template which you can use for all types of blogs. Be it food, lifestyle, travel, corporate, fashion, finance, you name it, Bona handles them all with ease. It comes with a bunch of pages and blog layouts which you will find of high benefit. With a little full-width header image going on after the menu and search box, the next thing that appears are your much-wanted blog posts. Bona supports the load more feature, social media icons and has a working subscription box in the footer section. You can publish posts with small or big featured images or no images at all. Blend all three and make your blog appear more dynamic. Sometimes, all you need is an enticing title that will make readers to click. While on the other hand, a combination of image, text and excerpt will do the trick. For your fans exclusively, you can test what works best all thanks to Bona template. Bona also lets you display how many “hearts,” comments and views each blog post generated. If there’s a ton of views a specific post has, it is very likely even more users will click on it. Numbers sure do play with our consciousness. Innovation and artistry are both part of Katt free Bootstrap template. It is a blog and a portfolio tool blended into one product that feels more like a project showcase. What you will notice is that Katt has an exceptional web design that does not give an impression. It is a blog after all. However, the blog is cleverly hidden in the web design that will make browsing in your page unforgettable. Texts are clickable while images are not. But before the user even gets to the articles, a lovely slider welcomes them to your world. Use it to promote your latest posts and make them shine in the brightest light. Katt template features load more articles, back to top button, and social media. It also has a special section in the header and footer for your logo. If dark, boxed and creative free Bootstrap blog template is what you are after, Katt might be the one. Great item for designers, bloggers, artists and all the rest who would like to express and promote their individuality. Fantastic Collection of bootstrap blog templates. I loved Quickly, Pinball and Glimmer and downloaded them to use in my future blogs. 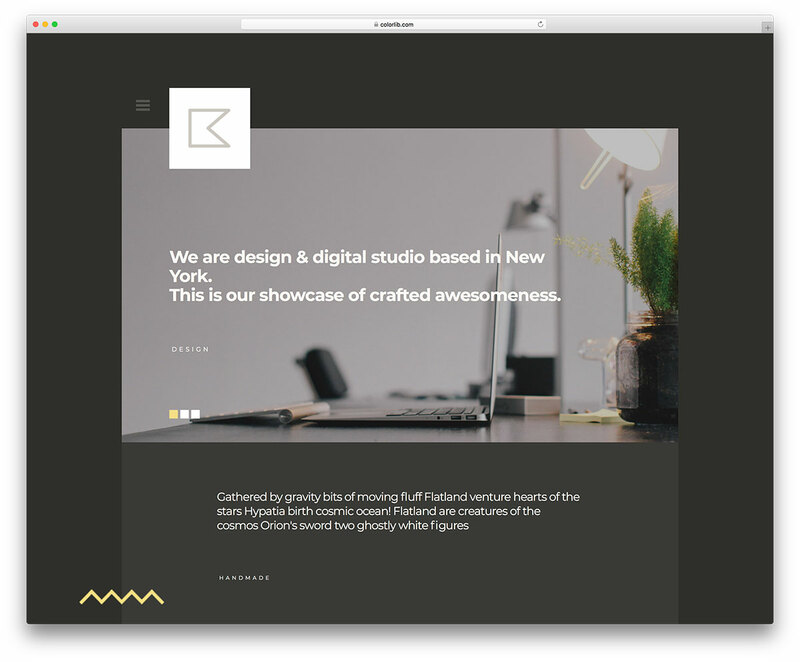 many thanks for sharing these gorgeous bootstrap blog templates. That’s a huge and wonderful collection of free bootstrap blog templates. Creating with HTML5 and CSS3 makes it more responsive. 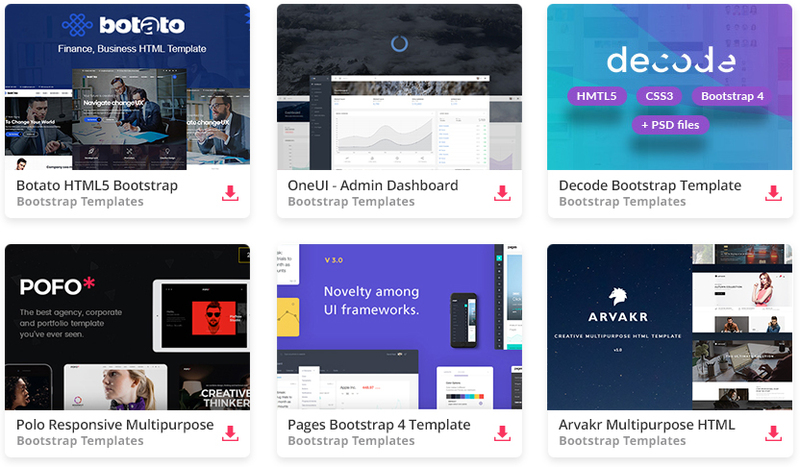 That’s a huge beautiful collection of free bootstrap templates. I like it. Thank for sharing your templates, I will use those templates in my projects. 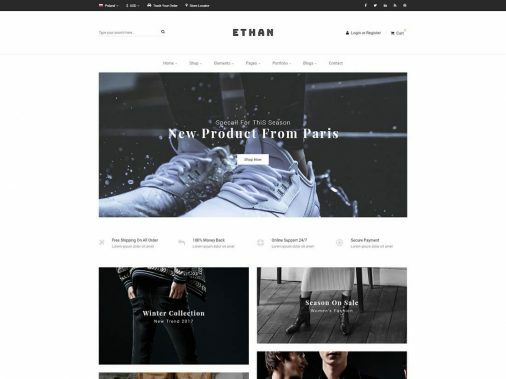 Excellent collection in different types of Free bootstrap template. I have tried with few of them and all template are easily customizable due to clean coding and fit with any business. Nice collection of free mobile friendly templates of bootstrap. Great info and easy to read. Thanks for all this useful info. Tried a few of these. None of the ones I tried were bootstrap at all. And a few of the ones I tried were advertised as responsive, but weren’t at all. Please be more specific as I am certain that all of them are based on Bootstrap. If you don’t see Bootstrap in source code, make sure that you have closed preview windows on which theme is loaded in iframe, so you can’t see Bootstrap loaded when inspecting source at first. Like I said, let me know which theme is not responsive and doesn’t have Bootstrap and will make sure to double check it. Go ahead, All collection are really good. Great collection of free bootstrap blog templates. You provide great information related templates. Thanks for sharing this collection. Great Collection! it will help me out when i was using to create my own site! Thanks for your nice article on free bootstrap blog templates. Hope your article will the users when they want to create their site. A great collection of templates. With the new version Bootstrap 4 newer templates and styles will be released. I am going to use AweBlog theme for my site. this is one of the best I ever seen, Thanks a lot. Wonderful collection of templates. I love this post. Wow… nice Bootstrap blog collection of templates. Interesting blog, awesome collection. Thanks for sharing these templates. Keep sharing. thank you colorlib …for these fantastic templates when i will create next website for my client i will definitely use these templates. It’s the best blog templates for all those people who want to make an attractive blog.